Yesterday was head down and bum up. I had a few projects that needed finishing and with it being a cool day it was just perfect for having the oven on for a few hours baking the Christmas cake. The recipe I used is one from my old school home economic class which has always been easy and reliable. Once the cake was in the oven that left me free to do my other project, which was making a simple smock dress Miss Sarah, who was selected to recite a poem for the Italian Poetry Competition tomorrow against other schools. I not only made one but two as she is doing it with a friend. The idea is for them to look like two little peasant girls, so I made them gingham head scarfs also. Phew! Unfortunately my poor old sewing machine has decided it doesn't want to wind cotton onto the bobbin anymore and I just managed to complete the job. Not a good time of the year to try and get her serviced before Christmas, wish me luck. While all this was going on, my man had the day off work and decided it was time to have a go at some paving. This area was part covered in broken concrete and part dirt, dump area (previous owner). I thought I'd love to make it into a usable space where we can sit under the fig tree and enjoy it's shade. I was adamant I didn't want it to have a neat sterile look and lets try and recycle as much as we can. So after we smashed up the concrete we are using some of the broken pieces as pavers, mixed in with a stack of bricks that was here and some slate pavers that we bought. It's like a jigsaw putting it all together and I hope it will look good once it's set in place properly. He's a good man putting up with my crazy ideas as each piece is of a different thickness, so he's got a bit more work to do. Doh! My vision using above image as inspiration, is that in time moss will grow between the cracks to help soften the look. We'll have some potted plants and a simple outdoor setting which I collected from the curb that's in need of some renovation and we'll be able to relax in our new space that was never used before. Maybe even before Christmas if we're lucky. I Like that paving. i too have a pile of slate, old bricks and broken concrete, waiting to be turned into a paved area. Might have to do it myself..
Love that first photo, how inviting a spot to bake your cake. Cute peasant dress too! 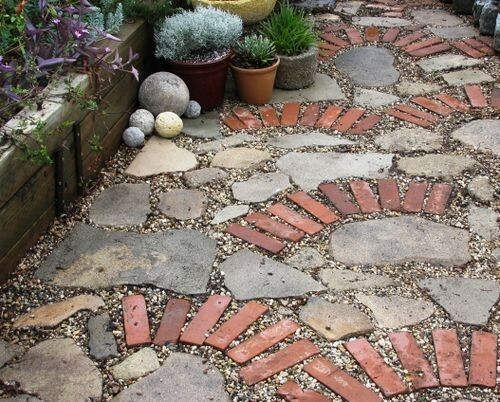 And the paving will look fabulous based on your inspired photo. Good luck! !